Five Filipinos, including WBA welterweight champion Sen. Manny Pacquiao, will see action in the 9-fight, 82-round card at the MGM Grand Garden Arena in Las Vegas this Saturday night (Sunday morning, Manila time) with Al Haymon of Premier Boxing Champions and four promotional groups getting together to stage the first major pay-per-view ring event of the year. Pacquiao will headline the show in his first title defense against four-time world champion Adrien (The Problem) Broner of Cincinnati. 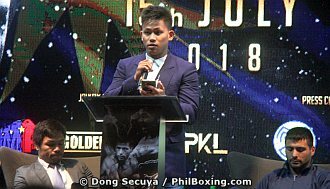 The other Filipinos in the blockbuster program are interim WBA featherweight ruler Jhack Tepora defending against former WBC superbantamweight king Hugo Ruiz of Mexico in a 12-rounder, Rey Perez taking on Australia’s unbeaten George Kambosos, Jr. in a lightweight 8-rounder, Genesis Libranza facing Nicaragua’s Carlos Buitrago in a flyweight 8-rounder and Jayar Inson battling Texan Jonathan Steele in a welterweight 8-rounder. Haymon is collaborating with MP Promotions, Tom Brown of TGB Promotions, Leonard Ellerbe of Mayweather Promotions and Ravone Littlejohn of About Billions Promotions to put up the show. Matchmaker Sean Gibbons and MP Promotions head Joe Ramos coordinated the event, assembling the lineup of Filipino fighters. It will be Pacquiao’s first fight in the US since outpointing Jessie Vargas at the Thomas & Mack Center in Las Vegas in November 2016. The much-awaited return also reunites Pacquiao with long-time trainer Freddie Roach who wasn’t with the team when the Filipino icon halted Lucas Matthysse to wrest the WBA crown in Kuala Lumpur last July. Roach will be in Pacquiao’s corner for the Broner fight but Buboy Fernandez will take charge during timeouts in between rounds. Cutman will be California Boxing Hall of Famer Dave Martinez, a decorated Vietnam War medic. Four fights will be shown on TV via Showtime, Dish Network, iNDEMAND and Direct TV in the US. In the Philippines, the telecast will be free-to-air on ESPN5 and GMA7 and available on pay-per-view via Cignal and Skycable. The four fights are Pacquiao-Broner, Rau’shee Warren-Nordine Oubaali for the vacant WBC bantamweight throne, Badou Jack-Marcus Browne for the vacant WBC Silver lightheavyweight crown and Tepora-Ruiz. Tepora, 25, stakes not only his interim WBA title but also his perfect record of 22-0, with 17 KOs, against the hard-hitting Ruiz. It could be a quick ending as both fighters are knockout artists who like to start strong. Of Tepora’s 17 KOs, eight came in the first round. Ruiz started his career with nine consecutive first round KOs and has now registered 18 KOs in the opening round in compiling a record of 38-4, including 33 KOs. Ruiz, 30, enters the ring with a 3 1/2 inch advantage in both reach and height. Perez, 28, is a globetrotting journeyman with a 24-10 record, including 8 KOs. He has a 3-8 record in fights outside the Philippines but is 3-2 in his last five outings in the US. The Zamboanga del Norte fighter will have his hands full against Pacquiao’s chief sparmate Kambosos who’s being lined up by manager Justin Fortune for a world title fight within the year. Kambosos is now ranked No. 9 in the lightweight division by the WBO. Kambosos, 25, has a 15-0 record, with 9 KOs. Libranza, 25, has a 17-1 record, with 10 KOs and his only loss was a fourth round stoppage by Moruti Mthalane in an IBO flyweight title fight in South Africa in 2017. Buitrago, 27, is more experienced with a 30-4-1 record, including 17 KOs. In 2013, the Nicaraguan battled then-WBO minimumweight champion Merlito Sabillo to a split 12-round draw at the Araneta Coliseum. He’s coming off back-to-back KO losses in world title bouts, bowing to Japan’s Hiroto Kyoguchi for the IBF minimumweight crown and to Puerto Rico’s Angel Acosta for the WBO lightflyweight belt. Libranza of Agusan del Sur has won six in a row since the setback to Mthalane. Inson, 28, is a 5-10 southpaw from Davao del Sur with an 18-1 record, including 12 KOs. He’s won his last five outings, including a decision over Australia’s Terry Tzouramanis on the Pacquiao-Matthysse undercard in Kuala Lumpur. Inson has won fights in Japan and Beijing. Steele, 27, has an 8-2-1 record, with 6 KOs. Photo: WBA Interim world featherweight champion will stake his belt against Hugo Ruiz of Mexico on the undercard of the Pacquiao-Broner fight this Saturday at the MGM Grand Garden Arena in Las Vegas.